SmartPublisher ™ is an easy to use publishing suite that empowers creators of newspapers, magazines, and classified ads to increase revenue and improve efficiency for their operations. Request a demo today or call 971.244.8888 and learn why more than 650 newspapers, magazines, online publications and email publishers chose SmartPublisher ™ . SmartPublisher ™ is a proven software solution having published more than a billion dollars worth of ads. Let our leading-edge content management (CMS) software take the complexity out of print and digital advertising. 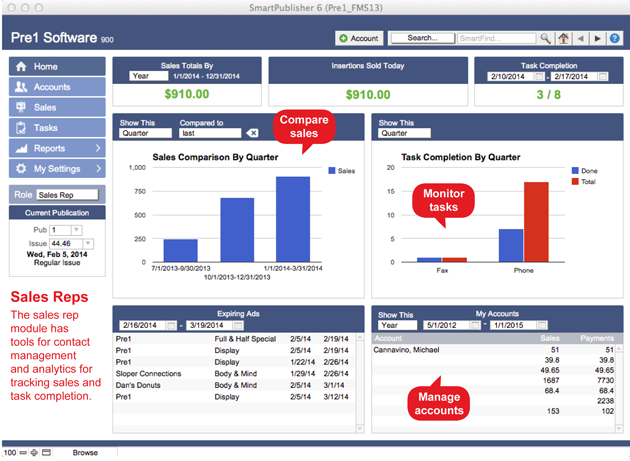 SmartPublisher’s ™ ad sales management system (CRM) lets you take control of contact management with task/appointment tracking and prospect/client follow-ups. SmartPublisher’s ™ online advertiser portal creates a personally branded website for your publication where advertisers can pay invoices by credit card. Advertisers are billed electronically and pay through a secure online provider. No personal financial information is stored in SmartPublisher ™ . SmartPublisher ™ magazine, classifieds, and newspaper software will not only help your sales team increase ad sales SmartPublisher ™ will also help your accounts receivable team collect on outstanding invoices. SmartPublisher ™ tools let designers export fully formatted classified and display ads into industry-leading pagination software. SmartPublisher ™ advertiser portal lets your advertisers review their payment history online reducing the number of in-person or email requests your accounting staff has to field. Advertisers also have access to self-help information about their accounts. SmartPublisher ™ Subscription module lets your manage the subscription process with one vendor. You can create, manage, sell subscription from your website and have all the reporting information at your fingertips with our software. Your subscribers can pay, renew, stop and start for vacations from the web anytime they would like. SmartPublisher ™ also features a powerful accounts receivable system designed specifically for the ad billing and collection needs of publishers. Targeted tools let you generate and email quotes, invoices and statements, track general ledger code and create detailed financial reports. Your Clients can Buy subscriptions from your website! See their history. Request a demo today and find out why over 650 publications have sold over a billion dollars in ad sales using SmartPublisher ™ .